Jean-Pierre Delmas, known by the students at Kadic as Mr. Delmas, to Sissi as Daddy or Dad, and is the headmaster/principal of Kadic. He is very straightforward and weak-minded, as his daughter Sissi can often boss him around, sometimes to the advantage or disadvantage of Team Lyoko. He is very ignorant and gullible as seen in his dealings with his daughter and members of Team Lyoko. She has convinced him many times to organize school dances and other activities for her (or rather, has demanded for him to do so). Jean-Pierre has also hinted in episode 91, Bad Connection, that he is an "electronics buff". Mr. Delmas acts as a stern headmaster at Kadic. He believes that his mission is to mold the children into fine adults, and for this reason he is generally very harsh on them. While he is usually strict on the students exspecially during season 1, he is shown to care deeply about their safety and well being. He tries to present himself as someone students can go to to talk about their problems and issues in spite of his aforementioned harshness. He often does the announcements at school via the PA system, as most principals of schools do. Notably, when communicating with Kadic's student body, he will uses the term "children" to address them; ex. "Children, have any of you seen William? ", "Children, please give me your attention." (Nicole Weber did this as well, in Unchartered Territory). While he believes in following the rules to the letter, he bends the rules to allow Ulrich to go to the hospital with Odd in Killer Music - at first he tells him that he can't let him leave, but realizing that Odd is indeed about to die he is forced to let Ulrich accompany Odd to the hospital. Jeremie Belpois: Mr. Delmas is very strict on Jeremie as well as all of his students, especially when it involves rule breaking. He is shown to care about his grades (as Jeremie has one of the highest GPAs in the entire school) and questions his motives for occasionally acting up in class, as Jeremie is one of his best students. Mr. Delmas is shown to care about Jeremie's well being, and fired Jim when he accidentally injured Jeremie. Odd Della Robbia: Mr. Delmas has rarely interacted with Odd; the one notable time they did interact was when Odd tried to convince Mr. Delmas to put him in the same class as his friends. Yumi Ishiyama: Mr. Delmas' interactions with Yumi have been mostly negative due to their circumstances. The first notable interaction was when Yumi tried to convince him that X.A.N.A. was trying to cause a nuclear explosion. The second time, he was threatening to call Yumi's parents over X.A.N.A. 's clone of Yumi attacking the school Nurse. The third time was when he threatened to expel Yumi from Kadic Academy if she skipped or was late to class one more time. In evolution, he and Yumi are shown to talk about the stress of being at the school. Ulrich Stern: Mr. Delmas appears to dislike Ulrich for multiple reasons. The largest of these reasons is that Ulrich has some of the worst grades in the school, which frustrates his father who then blames him. Also, his daughter, Elizabeth, has had a crush on him for years, and he would like that drama out of his life. William Dunbar: He has been angry with William's clone, due to it stupidity. He also dislikes William because he is a rebel. Sissi is Mr. Delmas' daughter and the self proclaimed "Queen of Kadic". Mr. Delmas tries his hardest to keep her happy, but this may have caused her to become the selfish girl that she is now. Mr. Delmas is shown to give her a large allowance but won't give her a penny more. Sissi has been known on multiple occasions to persuade her father to hold school dances in the gymnasium. As headmaster of Kadic, he holds his daughter to a very high standard, and punishes her for failing the final exam. Mr. Delmas seems to have a slightly negative relationship with Jim. Mr. Delmas grows tired of Jim's claims that Jerimie, Yumi, Odd, and Ulrich are hiding something. He even fired Jim when he accidentaly caused Jeremie to fall down the stairs, thus breaking his ankle. While Jim is only a gym teacher, Mr. Delmas uses him to do most of the odd jobs that require fixing at the school. Mr. Delmas is shown to be quite fond of Mrs. Hertz. Jean Pierre claimes that he is an electronics buff, and great at fixing phones, but this has yet to be seen considering that he broke Sissi's phone. XANA-Jean-Pierre In the season 2 episode Ultimatum, and the season 4 episode Wrong Exposure, Jean-Pierre was possessed by XANA twice. However, in both episodes, he was possessed without his daughter being possessed with him. He displayed super strength, shooting electricity out of his hands, immunity to cold temperatures, controling his car with his mind, super speed (even on water), and martial arts. In Ultimatum, he is possessed to kidnap Odd and Yumi as part of an ultimatum. He knocks William aside when he tries to help them, and eventually his actions are reported to the police. Jean-Pierre takes the two into his car and takes them to a refrigerated warehouse, where he is ordered to keep them alive until the ultimatum times up and he is ordered to kill the two. However, Ulrich manages to track them with Jeremie's bomb that was built to stun a person possessed by XANA, and the bomb works to his advantage, causing Jean-Pierre to be momentarily stunned before regaining consciousness, where he goes to the Factory and fights Ulrich and Sissi. Here, he shows no hesitation in fighting his own daughter, showing that his will was under XANA's complete control. However, after Aelita deactivates the Tower, he is released from XANA's possession and the memories of his kidnapping of Odd and Yumi and Sissi learning the secret of Lyoko are erased with a Time Reversion. In Wrong Exposure, he was possessed again to kidnap Aelita and deliver her to the Scyphozoa so it could possess her and make her jump into the Digital Sea. He pulls her out of detention with Jim and orders him to keep the others from leaving (but they defeat Jim using their new skills from commando camp) and virtualizes her to the Forest Sector where the Scyphozoa awaits. He then goes back up, and while Jeremie virtualizes Ulrich and Yumi to the Forest Sector, Odd remains behind to fight Jean-Pierre. However, he ends up twisting his ankle, and before Jean-Pierre could kill him, Aelita deactivates the Tower, freeing Delmas, and triggering a Time Reversion. He fired Jim in Code: Earth, because he had caused Jeremie to get hurt, but a time reversion in False Start made him forget all about the incident and allowed Jim to have his job back. It's unknown what became of his wife, though Sophie Decroisette implies divorce in an interview. He was possessed by XANA in Ultimatum, Wrong Exposure, and Bad Connection. He has been in the factory multiple times to reprove/scold Jeremie before returning to the past and losing his memory of the factory. It's hinted by his own words in Echoes that he is quite generous when it comes to Sissi's allowance, but he refuses to give her another cent. Several other episodes reveal that he could also be strict concerning his daughter's academic performance, as he grounds her for failing the science final in Final Mix. Beyond this, he rarely ever punishes her in the show. His personality has, like Jim's, also changed for the worse. In Season 1, he was usually lenient and calm except when the student body revolts against his anti-cell phone policy. In Season 4, he is much more stern, cold at times (especially around his daughter Sissi) and stricter. However, his personality remains congenial and convivial in the video games to appeal to younger fans. 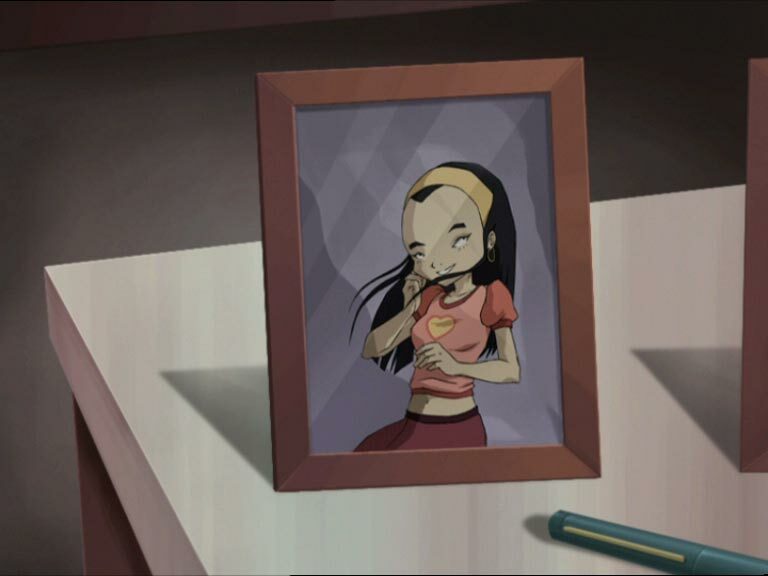 In William Returns and Straight to Heart reveal that Jean-Pierre has several pictures of his daughter on his office desk. Next to it is a frame for another picture of Sissi. He is addicted to a penguin themed computer game that he is terrible at (and at which his secretary seems to be a lot better). Odd names his Tamagotchi after him in False Lead. In the novels, it's revealed that the password of his computer is sissidelmas. This is obviously his daughter's name. In the French version of Code Lyoko, his voice is provide by Bruno Mullenaerts. In Evolution, Delmas has no beard and no glasses. Welcoming parents to the school play. With Jim and a firefighter in Maiden Voyage. He doesn't seem to happy. Shown in the factory camera. Talking with his daughter, Sissi. Introducing the candidates for being crowned beauty queen. Mad at Sissi for failing her test. Nicole Weber shows him how to play his penguin game. With Jim and Jeremie in Evolution. Right before a Time Reversion in Exploration. Listening to Sissi's recording of Jeremie and Aelita. Showing Patrick Belpois into his soon-to-be dorm. He grab Odd and Yumi by force. Eye of X.A.N.A. in his eyes. He confiscates Odd's and Yumi's phone with his electrical power. Electrocute Odd and Yumi in Ultimatum. Ulrich throws the EMP Bomb onto Mr. Delmas. Sliding on the river into the factory. Under X.A.N.A. 's possession, Mr. Delmas electrocute his own daughter. You can somewhat see him on the stairs here. With Jim and Chris Morales in Opening Act. In front of the students with Jim and Chris. With Sissi and Jim in XANA Awakens. With Johnny in The Pretender. Secret agents show up in his office. In Jeremie's room with the agents. The agents inspect Jeremie's room. They have surveillance cameras all over Kadic. Sissi telling him about Lyoko Warriors's secrets. Thinking she is nut, he drag her to the infirmary.